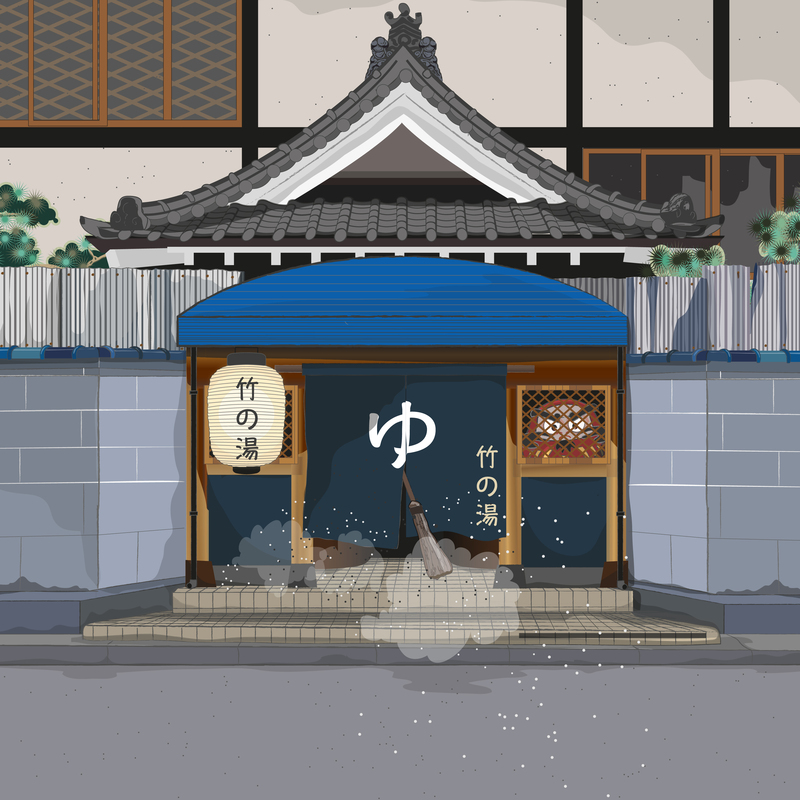 Miko-chan was very excited one morning at the beginning of February, as the residents of the Bamboo Bathhouse were about to perform the bean scattering ceremony of mamemaki (豆撒き) for Setsubun and the eve of spring. Japan has four very distinct seasons – known in the seasonal almanac as Risshun, Rikka, Rishū, and Rittō (spring, summer, autumn and winter). All of these were marked in the old lunar calendar before the Gregorian calendar was adopted. The eves of all of these seasons were known as ‘setsubun’, meaning ‘seasonal division’ but in modern day Japan only the eve of spring or Risshun (立春) is properly marked, and therefore only this one is now associated with Setsubun (節分). 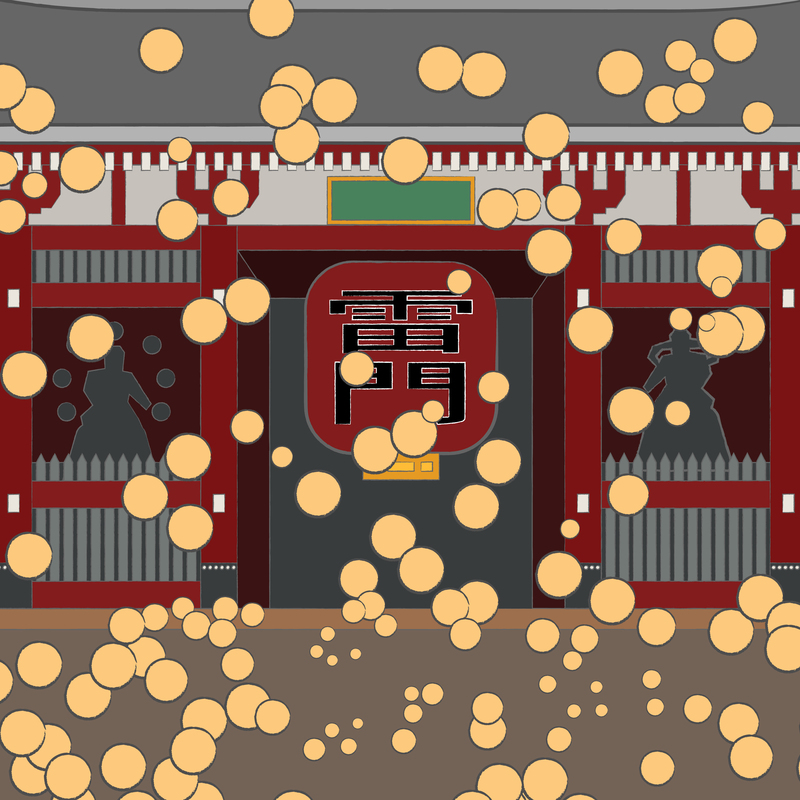 It was once also New Year’s Eve, and was accompanied by various cleansing rites and efforts to encourage good fortune. Miko-chan had read about mamemaki, the custom of scattering beans to drive out evil spirits and purify the home for the coming year. 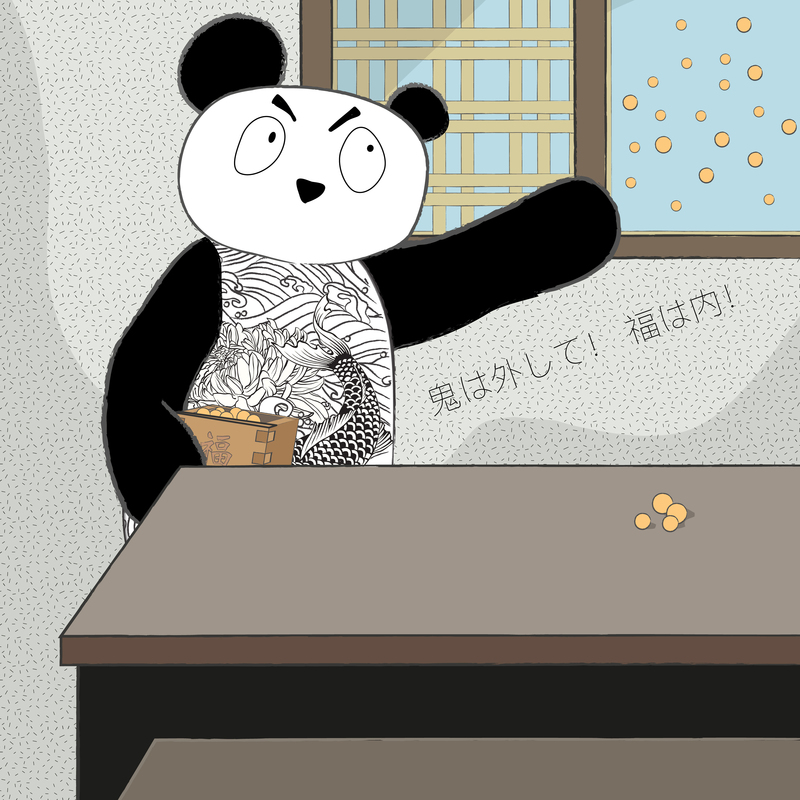 Boss Panda had told her that the custom had started in homes in the 14th or 15th century, and that a public bean scattering ceremony was first performed in Tokyo at Senso-ji temple sometime during the Edo period and now happened at various temples across Japan. He explained that a square wooden measuring cup known as a masu would be filled with roasted soybeans called fuku mame (福豆/ “good luck beans”) and that as head of the household he would then throw these about the house, shouting “demons out, fortune in!” (oni wa soto! fuku wa uchi!/ 鬼は外! 福は内! )*. Beans are also thrown out of windows, sometimes at a member of the family dressed up as a demon, and the doors slammed. Once the bean throwing is over, it is customary for people to eat the same number of beans as their age, to ensure good health for the year. 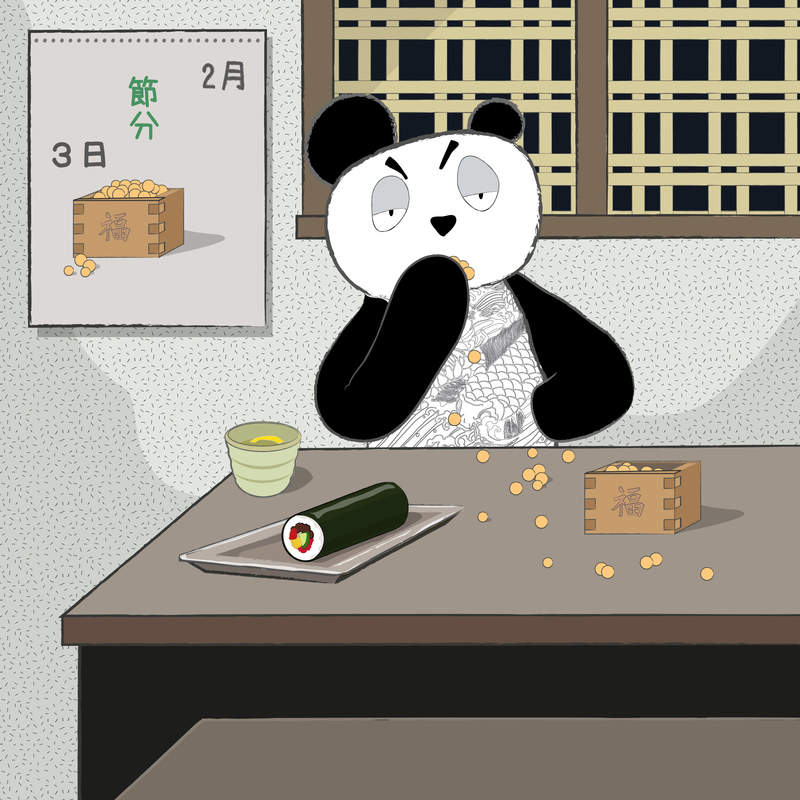 Miko didn’t know exactly how old Boss Panda was, but knew he would have to eat a lot of beans. 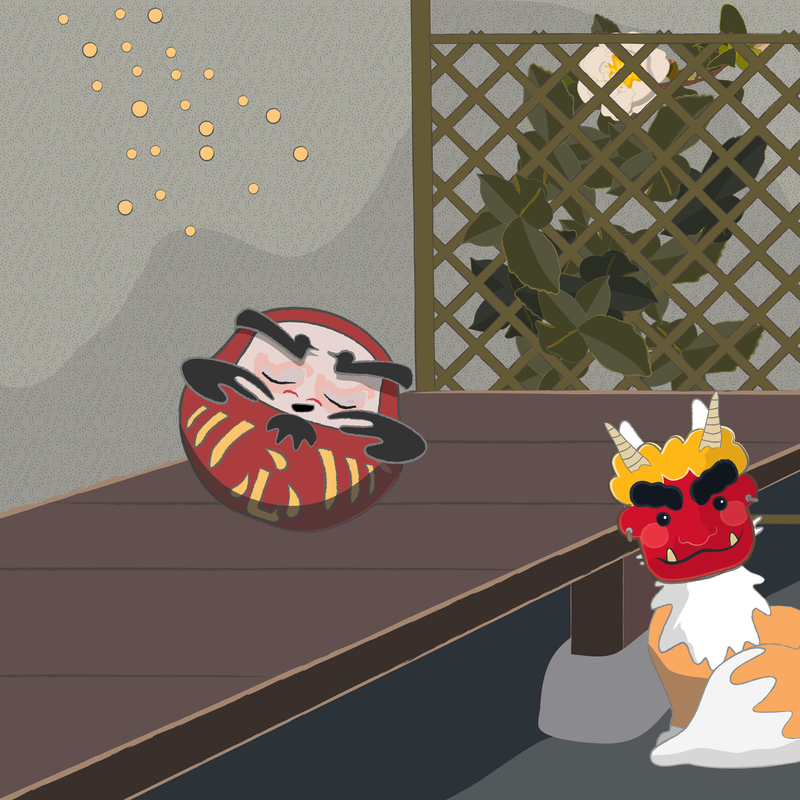 In order to perform the ceremony for the Bamboo bathhouse, Boss Panda suggested that Kiku wear a demon mask to make it more fun. As the old bear went about scattering beans, Miko-chan and Mama Kōjin helped with shouting “demons out, fortune in!” and slamming shut any open windows and doors. 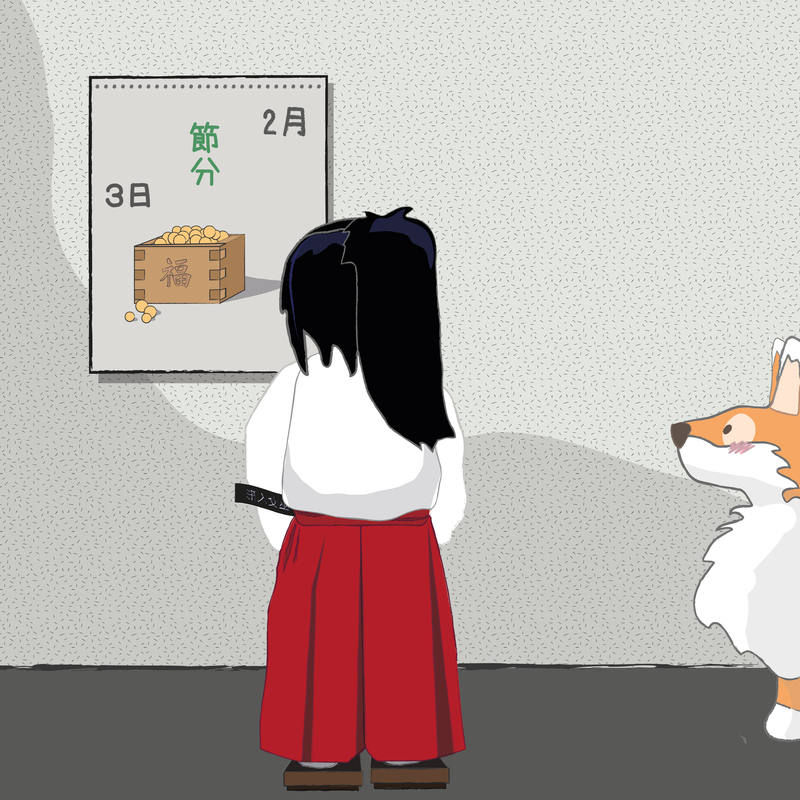 As they came to one of the windows overlooking the little back garden, the demon mask wearing little fox appeared and Boss Panda threw a large handful of the soybeans out, just as Miko-chan gasped, remembering too late that Dokidoki Daruma had been sleeping on the engawa outside. A familiar sound began, and the inhabitants of the bathhouse instinctively ducked. 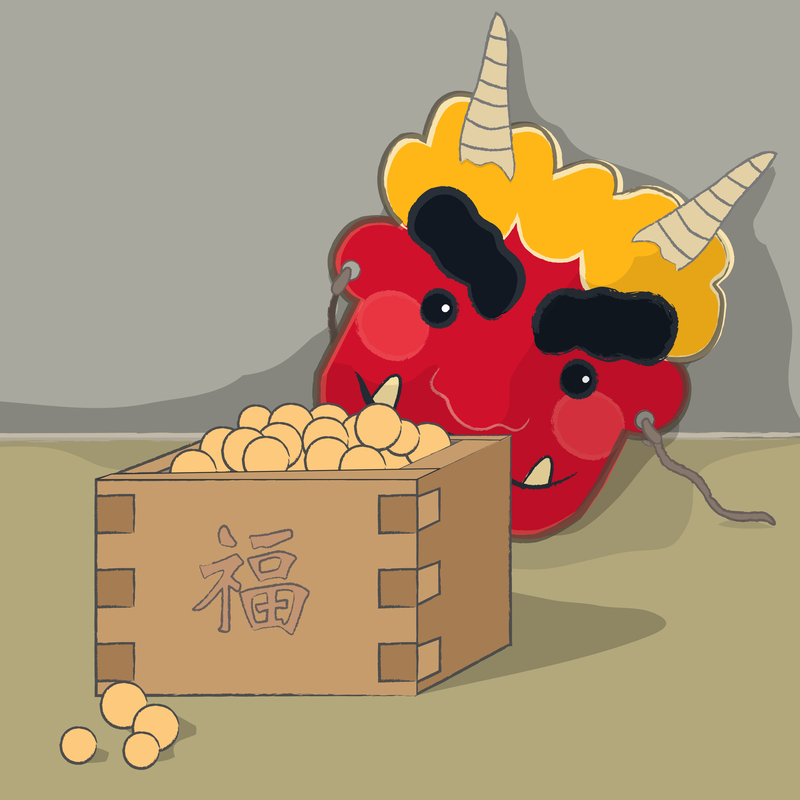 The grumpy little Daruma doll who lived the bathhouse was prone to becoming agitated at unexpected events, in this case a shouting demon appearance and being unexpectedly pelted with hard little beans. 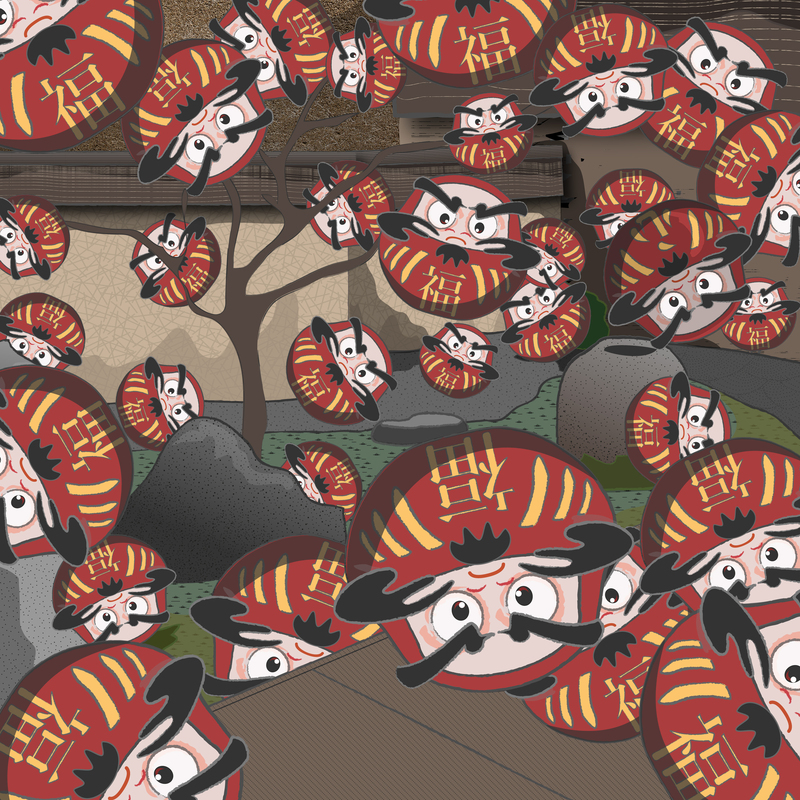 And when this little Daruma got agitated, he would do what he could to protect himself – heart beating wildly, getting louder and louder, and then exploding into multiple copies of himself, and generally causing chaos and a big clean up. Within a few seconds, a loud ‘kaboom’ was heard, shaking the bathhouse windows in their frames, and when Miko-chan eventually summoned up the courage and poked her head out of the sliding door, a familiar sight awaited her. Tens of Daruma dolls of all sizes filled the little space in the back garden, bouncing around and bashing into each other. They all looked the same – save for one difference. Most daruma dolls, being talismans for wish making, have the good fortune character [福] on their bellies, but Dokidoki, a sensitive soul, had the character for ‘heart’ [心]. Can you spot Dokidoki Daruma amongst his lookalikes? * Unlike at other places, at Senso-ji they shout “Long life and good fortune, come in!” because there are no demons in front of Kannon (the Buddhist deity of mercy). **A custom originating in Osaka of eating a type of uncut futomaki called ehō-maki or ‘lucky direction roll’ (恵方巻), has become more widespread with some stores in Tokyo now selling it as part of the setsubun tradition. For those intent on doing all they can to ensure good fortune for the year, it should be eaten in silence whilst facing the year’s lucky compass direction, depending on the zodiac symbol of that particular year. An even older way of driving away evil spirits at New Year was to burn wood, or sardine heads, and to sound drums. 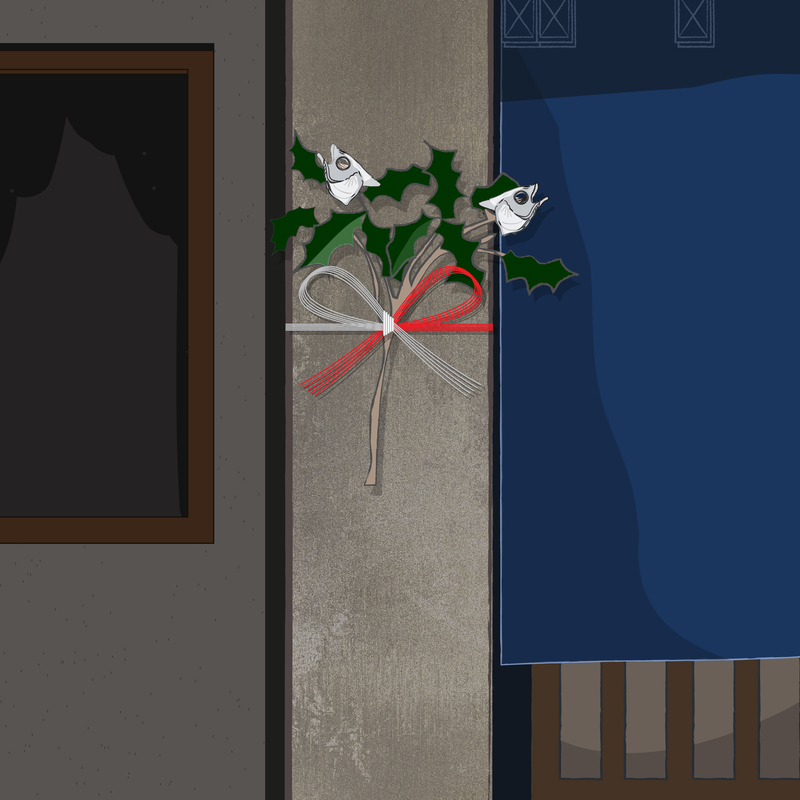 Some households still put up small decorations of sardine heads and holly leaves (柊鰯/ hiragi iwashi) on their house entrances so that bad spirits will not enter.